Buying a car, whether new or used can be a stressful experience. You are bombarded by information from different sources. How do you know who to believe? Who can help you separate fact from fiction? Our dedicated team of inspectors are at your service. We have a more detailed vehicle check points than any other car inspection organisation. We spend more time, take more care, and charge you less than other car inspections services. When your making a vehicle purchasing decision, you need to talk to someone you can trust… let our friendly experts take the uncertainty out of your decision. We inspect vehicles of all makes and models 7 days a week. Whether it is at homes, auctions, dealerships and anywhere where a car can be safely inspected. Our 7 page report that is thoroughly detailed with an itemised 350 check points, our highly qualified inspectors are sure to detect any faults, damage, and poor workmanship on any vehicle we inspect. When purchasing a used car it is difficult to tell what you are buying and if it is really worth the money you are spending. Often enough people are getting stuck with cars with serious problems. This is why we strongly recommend a pre purchase inspection. It can save you a lot of money and potential headaches. 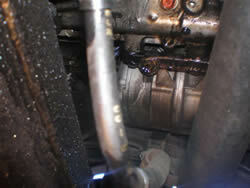 2005 Nissan 4wd after our inspection: Leaking diesel pump can cost in the thousands to repair.